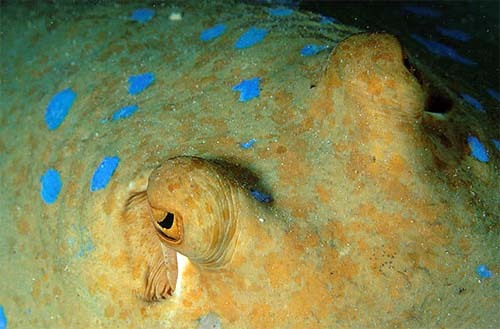 This smaller ray (12 to 14 inches across) has an oval pectoral disc that is usually yellow to brown to olive-green and scattered with blue spots on top, and white underneath. 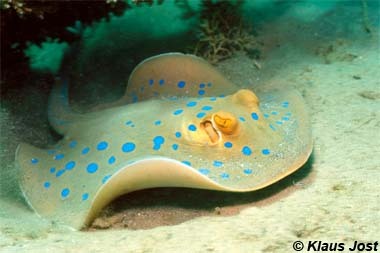 It looks a lot like the bluespotted stingray, but this ray is much rounder and has a noticeably thicker tail. It has two venomous spines on its tail, but it tends to be shy to humans and will only use these as defense if threatened or stepped on. They prefer hunting crustaceans and small fish in reefs, and will follow the high tide into shallower, sandy areas. English language common names for this species include bluespotted ribbontail ray, blue spotted lagoon ray, blue spotted stingray, blue-spotted fantail ray, blue-spotted lagoon ray, blue-spotted ray, blue-spotted ribbontail ray, blue-spotted stingray, bluespotted fantail ray, bluespotted ribbontailray, bluespotted stingray, lagoon ray, lesser fan-tailed ray, lesser fantail ray, reef ray, ribbon-tailed ray, and ribbontail stingray. Other common names include ali maduva (Sinhalese), ath maduva (Sinhalese), blåplettet pigrokke (Danish), blauwgestippelde pijlstaartrog (Dutch), bloukol-lintstertrog (Afrikaans), ikan pari (Malay), kiampao (Cebuano), krabane tong (Thai), lukhmah (Arabic), nauhakeihäsrausku (Finnish), nyenga (Swahili), pagi (Tagalog), pari karang (Malay), pari kembang (Malay), pari reben (Malay), pastenague queue à ruban (French), rajalátigo rabo cinta (Spanish), ratão pintalgado (Portuguese), ruget (Arabic), shafane (Somali), trnucha lemovaná (Czech), vali (Gela), and yilinggan (Guugu Yimidhirr). The bluespotted ribbontail ray is taken by commercial fisheries as well as by recreational fishers as a game fish. This species is also popular with home marine aquarists although it tends not do well in captivity. 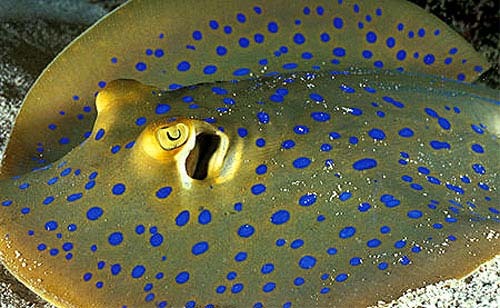 Bluespotted ribbontail rays are often shy, swimming away when approached by divers. However, when threatened, it will use its venomous tail spine to deliver venom into narrow groves running lengthwise along the underside of the stinger. The entire structure is covered by a thin layer of skin which, when broken, releases its venom into its victim. The sting from its spine can be quite painful. > Check the status of the bluespotted ribbontail ray at the IUCN website. Although the bluespotted ribbontail ray is widely distributed, it is subject to human-pressures due to intense inshore fisheries and widespread habitat destruction of reefs. It also suffers pressure from the marine aquarium fish trade due to its popularity with home aquarists. The bluespotted ribbontail ray is found in the Indo-West Pacific region including the Red Sea and East Africa to the Solomon Islands north to Japan and south to northern Australia. 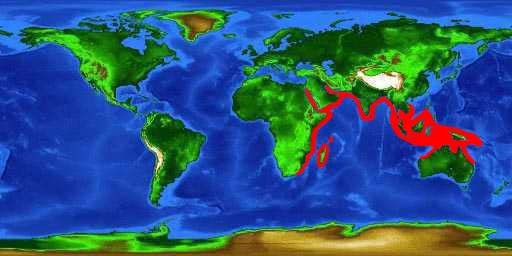 In Australia it has been recorded from the central coast of Western Australia and to the northern tropics, and south to the northern coast of New South Wales. Bluespotted ribbontail rays are found in shallow temperate and tropical waters over continental shelves to depths of 66 feet (20 m). As a resident of coral reefs, this ray disperses during falling tides to take up shelter in crevasses and under rocky ledges. During rising tides, it migrates in small aggregations onto shallow sandy areas in search of prey. This species has rarely been observed buried under the sandy sediments. This stingray has an oval and elongated disc with broadly rounded outer corners. The snout is bluntly rounded with slender narrow nostrils and the spiracles are large and located close to the large eyes. The mouth and gills are located on the ventral surface of the ray. The pelvic fins are moderate in size and slender. The tail is stout and tapers, measuring less than twice the body length. The lower caudal finfold is broad and reaches the tip of the tail. There is usually two, but sometimes one, medium-sized spines present on the tail used to fend off would-be predators. 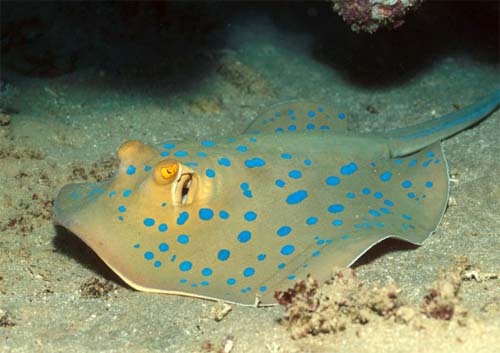 The bluespotted ribbontail ray may be confused with the bluespotted stingray (Dasyatis kuhlii) which is also found inshore over coral reefs. However, the bluespotted stingray can be distinguished with its more angular disc and a more slender tail. A visually interesting ray, the bluespotted ribbontail ray is grey-brown to yellow to olive-green or reddish brown in color with large bright blue spots across the dorsal surface of the disc. There are blue stripes on either side of the tail. The ventral surface is uniformly white. Inside the mouth, the numerous small teeth are arranged in plates and used for crushing prey such as mollusks and crabs. 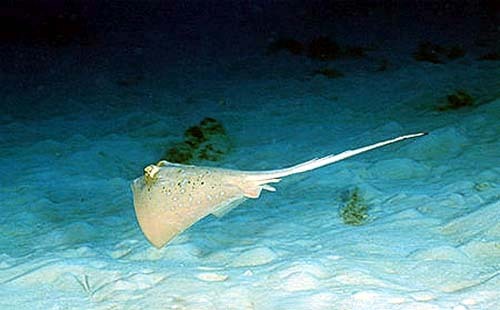 The disc of this ray is smooth with the exception of a small patch of thorns along the midback dorsal region of adult specimens. The maximum reported size of the bluespotted ribbontail ray is 12 inches (30 cm) disc width and a maximum total length of 28 inches(70 cm). The lifespan has yet to be determined. 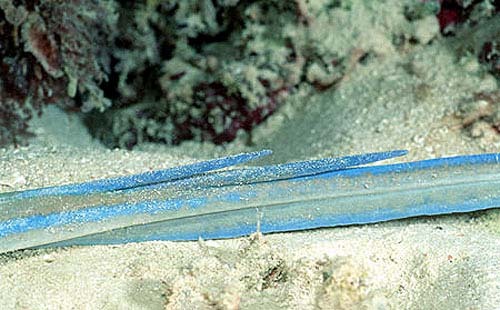 Feeding in sandy areas adjacent to reefs during high tides, the bluespotted ribbontail ray’s prey include mollusks, worms, shrimps, crabs, and small fishes. The reproductive mode of this ray is ovoviviparous with embryos feeding initially on yolk, then receiving additional nourishment from the mother by indirect absorption of uterine “milk” that is enriched with mucus, fat and protein. Females give birth to up to seven young per litter after a gestation period of 4-12 months (unknown). These young have markings similar to the adults including the characteristic blue spots. A documented predator of the bluespotted ribbontail ray is the hammerhead shark. The hammerhead shark pin the ray to the bottom substrate with its heads, avoiding injury from the venomous spines while removing flesh from the dorsal surface of the ray. Other potential predators include marine mammals and large fish such as sharks. Echinobothrium helmymohamedi n. sp., a cestode, is a documented parasite on the bluespotted ribbontail ray taken from the Red Sea. The bluespotted ribbontail ray was originally described as Raja lymma by Forsskål in 1775. This name was later changed to Taeniura lymma (Forsskål 1775). Taeniura, the genus name, is derived from the Latin taenia meaning “stripe” and the Greek “oura” meaning “tail”, referring to the coloration of the tail. A synonym referring to this species in past scientific literature is Trygon ornatus Gray 1830.